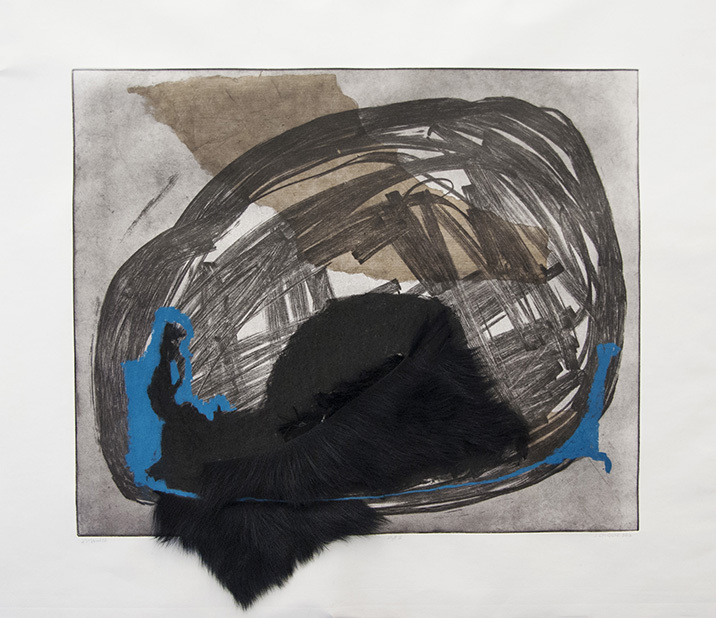 Drift was a body of work exploring line, material and space, the work included a three dimensional installation and a series of etchings. Drawing can be a final product but for me it is an exploration of ideas; ideas are fluid and dynamic. While I was working on two dimensional drawings on steel plates, I was also collaging paper and fiber into these final etchings, creating what print makers call, collaged varied editions. I was investigating energy of line and material, working simultaneously on the installation. It was a site specific installation within a four story area, where the exhibition space at the bottom vaulted up to the historical sky lighted ceiling of The Briggait in Glasgow, Scotland. The work could be accessed on all levels; a staircase that led down to the sublevel exhibition space and up to the ground level, first and second floor allowed viewing form each floor as well as a window from the first level opposite the staircase. 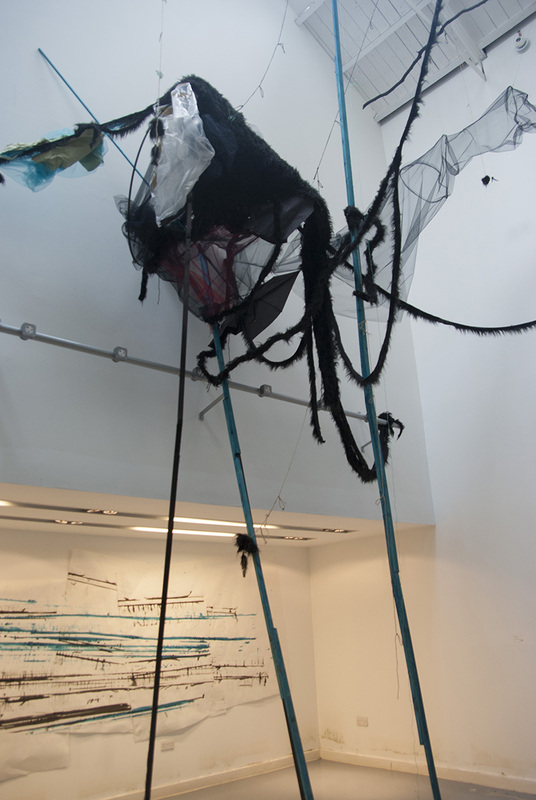 The work was done in The Briggait, over a three week period of installation. The etchings were printed and collaged at The Glasgow Print Studio. To see the picture gallery of etchings click on the image below. This exhibition has been documented in a small exhibition catalogue that has been photographed, designed and produced by Rachel Gillies. Gillies worked with me throughout the installation, lending a hand in all things that involved holding, hoisting, supporting, tossing, precariously standing under and precariously teetering on tall ladders. She provided perspective and critical support as well as the courage to undertake the challenge of documenting this project. The practical and conceptual transformation of information from a three dimensional space into print was no easy feat. Gillies did an outstanding job. You can preview the catalogue here.